This axial air mover is great for flood restoration, due to its ability to daisy chain multiple units together. Each flood drying fan comes with a built-in GFCI outlet for plugging other fans into it. With the low 2.2 amp draw per unit, you could easily daisy chain up to 6 units off of a single electrical outlet. A typical house outlet is 15 amps, so daisy chaining 6 of these flood drying fans together would only pull 13.2 amps. As long as nothing else is plugged in on that circuit, you would have no problem running 6 of these fans at once. The unit is stackable for storage, and operates in several different positions, allowing you to dry many different areas. For more similar units, take a look at our complete line of axial carpet flood dryers. Or, if you are in need of a more powerful fan, take a look at our complete line of drum & barrel fans. 2 speed switch allows you to use the flood drying fan in different situations. Stackable for easy storage, and has a molded & balanced handle for easy transport. Multiple position angling allows you to dry areas at many different angles. 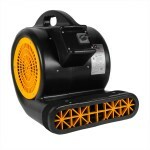 Great for drying flooded areas, due to the .25 HP motor's incredibly low amp draw. GFCI outlet is built in, and perfect for the flood restoration industry. This is a review for the Daisy Chain Flood Drying Fan.